Ideas are incredibly insidious things. You have them all the time and mostly they just flit through the mind before disappearing forever, as ephemeral as Martin O’Malley’s presidential run. Sometimes though, they get stuck and won’t allow you to forget them. It’s like a bad itch that you can never scratch sufficiently, not even with those little hands on a stick. You just keep scratching and scratching, never satisfied, just constantly trying to make the idea work, pushing it and pushing it until you realize that you’ve tortured this metaphor long enough and decide to awkwardly transition to the next paragraph. Brewing for me is an extremely meditative exercise for the aforementioned reasons. While I’ve had most of my success through deck tuning, I still enjoy that less than the joy of discovery in brewing up an entirely new deck, or exploring a new direction for an existing deck. There’s just something special with trying something new and experimenting that provides incredible relief when your mind is buzzing with possibilities. This is why, following last week’s article, I couldn’t help actually trying out the ideas I suggested. Are any of these actually good? I’m not really sure. But they might be, and definitely warrant further exploration. As I said last week, my initial impression of and of investigate in general is that it has very limited fair uses and its (currently known) unfair applications are almost certainly worse than pre-existing decks. I speculated that if Bishop had a home in Modern it would be in a “fair” deck, or a deck that does something fair in a very unfair way, of which the best one for artifacts is Affinity. I also thought it was too cute to be viable, but I said that about Nourishing Shoal in Reanimator and we know how that turned out. You never know until you try these things, so I did. And I am now very confused. I’ll start by explaining the deck I used. All I did to get here was take a number of Affinity lists, average them out, and then put Bishop in the contested slots. Not the most scientific, but when you’re just testing the viability of an idea you don’t expect to get it right on the first try. I should also note that while I am not an Affinity player, I’ve played against it and tested with it enough to play at a reasonable level. To actually test a single card, I remove one of them from my deck before playing, draw six cards like I’m taking a mulligan (without scrying), and then take the top three cards and shuffle in the test card, then draw my seventh card. This ensures that, in a typical game, I will see the test card, but I’m not guaranteed when I will see it. This more accurately reflects a real game than just starting with it in hand. I then play ten goldfish games and five against Jund to see if it’s a viable idea. I use Jund since it’s the most-played fair deck and I think it’s also the most “average” deck in Modern. It plays disruption, powerful threats, and burn, so if you’re weak to something, there’s a good chance Jund has it. I think this provides the best bang for your testing buck. My results from this were… odd. I’m intrigued but also unconvinced by . In the goldfish games, he felt like a win-more, and sometimes a won’t-win. He wasn’t as good as the usual Affinity payoff cards, but he was better than another Galvanic Blast. Sometimes he was just a 2/3 flier, which is just okay since at least he can wear Cranial Plating even if he doesn’t directly contribute to Plating himself. When I did generate value from Bishop it averaged three Clues over two turns which generally didn’t speed up my Ravager or Plating kills. Bishop only hit play once on turn one. Accomplishing that depleted my hand so much that I’m not sure the extra Clues really made a difference, especially since I didn’t have a payoff card for a few turns and lacked the mana to both make and break Clues in the same turn. I concluded that Bishop didn’t goldfish well, which wasn’t good news, but theory and reality don’t always reflect each other which is why I actually played some games before making a decision. The Jund games really muddied the waters for me. It was never correct for Jund to Inquisition of Kozilek the Bishop, and in play he drew fire from more important artifacts, usually after making some Clues. He was also completely resistant to Kolaghan’s Command and thus survived removal storms more often than Ravager, Overseer, and Master did. The other thing I didn’t appreciate was the power of the Clues themselves. I knew from theory-crafting and the goldfish games that Clues were “free” Ravager fodder, but what I didn’t appreciate until I tried it out was how good that was. Feeding Ravager without spending any real cards made Lightning Bolt much worse on a number of occasions and it also meant that when you went all-in on Arcbound Ravager you didn’t actually have to eat your entire board. The other thing about the Clues is that they’re fairly innocuous, so in Game 1 at least they’re not likely to be the target of Abrupt Decay or Maelstrom Pulse. That was relevant once when Affinity’s board got destroyed except for two Glimmervoids and one Clue. Of course, if they did eat removal, your business artifacts were safe. If it weren’t for the Clue, I would have lost everything, and before you ask, no, that game did not at the time include Mox Opal or Springleaf Drum which normally occupy that job. Once Affinity got some more artifacts into play, sacrificing the Clue was better than anything it could have done with an Opal or Drum (it wasn’t enough to win, but it was still better than the alternatives). From this I have to think that is worth pursuing in Affinity. There is value to be had in Bishop, and not being an artifact isn’t that big a burden, though again I’m not a dedicated Affinity player. The problem is that while I know what Bishop does I’m not really sure what it is for. He’s definitely not a sideboard card, since the Clues don’t help against artifact hate and Bishop’s stats aren’t enough to be useful in hate-filled games. He’s borderline as a maindeck card because he’s slow and only indirectly impacts Affinity’s gameplan. And yet, he has done enough good things in my, admittedly limited, testing that I think he might be worth it. On his own and untriggered, Bishop is mediocre at best. On the other hand, when you set him up it makes your Plan A much better. If you are an Affinity pilot I encourage you to at least try it out and tell me what you think. I’d love to know if I’m actually on to something here or if the card really is as win-more as I suspected early. Approaching the Dragonstorm suggestion was a far more tense exercise than I expected. On the one hand, the deck has quite a bit of history to draw from and I have experience with it to guide my process. 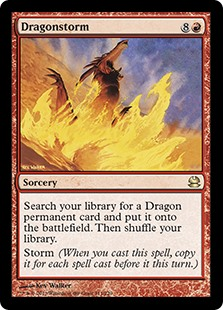 The problem was that nagging question of “Am I making a worse Storm?” I concluded pretty quickly that since Dragonstorm costs so much, the answer would always be “yes,” so I shouldn’t try to compete for the same deck space. This dovetailed nicely with my assessment of . Instead, this had to be a slower deck with a combo kill. The most famous version was Patrick Chapin’s Worlds 2007 deck which packed a Pyromancer’s Swath Plan B (also, because it is mandatory, the most famous on camera bad beat). While I don’t think Swath is playable in Modern, and just including a burn package isn’t viable (I don’t think stapling a bad Burn deck and a bad Storm deck together is a winning strategy), maybe including a Snapcaster Mage package would work. After all, there’s room in the format for a new Twin deck, why not see if this is it? I figured the Snapcaster package would give Dragonstorm enough time that it didn’t need to run all the rituals from regular storm. Manamorphose is here partially to be storm fuel and partially because it was suggested in the comments that Karrthus, Tyrant of Jund and Atarka, World Render are a strong sideboard plan for the deck so I want to have the option to hardcast them if it came to that. The testing procedure was the same as for the Affinity list, except for the card testing. Seeding cards was unnecessary since I’m testing an entire deck rather than a one-card addition. I don’t know much about Modern Storm so I checked around for the consensus on how to play Storm vs. Jund and what to expect. Apparently, discard coupled with pressure is very bad for Storm and it normally wins by going off very quickly. Surprise! This really isn’t possible for Dragonstorm so I anticipated not actually being able to storm off very often. I would instead rely on the Snapcaster plan to win. This didn’t fill me with confidence, since the way Twin dealt with this problem was Pestermite beatdown, and with only Snapcaster and Hellkite to do that I had doubts. The goldfishing games were a little schizophrenic. Every so often you got excellent storm hands and killed on turn four. Sometimes you got Splinter Twin hands full of interaction and Snapcasters. Most were in between, which made actually goldfishing very difficult, but they suggested this is the kind of deck that would reward tight play and format knowledge. A hand of Serum Visions, Snapcaster, Bolt, Vessel, and lands was pretty typical and could be good in a number of different ways, depending on the matchup and your playstyle. Doubly so when deciding what you’re scrying for. Simply playing out a Hellkite end of turn was a surprisingly fast kill as well and was also more common than I’d like. See Beyond may be necessary to prevent drawing all your Hellkites before you combo. As expected, Jund proved difficult. Liliana of the Veil was almost unbeatable and a discard- heavy Jund hand frequently left Dragonstorm with only high cost spells and not enough interaction to survive and draw out of its predicament. Decay was also surprisingly strong against Vessel. Dragonstorm could survive the initial onslaught well enough, but was frequently too out of gas by that point to turn the corner and win the game. The one win it did get was thanks to unmolested Vessel’s powering out drawn Hellkites. I suspect my build was trying to do too much and lacked enough of a unifying principle to work. Despite this, I saw enough good that I think a more optimal build might be passable. Flashing in early Hellkites was strong and would have won a second game if not for Terminate. When the Snapcaster package was running it was also quite potent. I was right about the power of Vessel and while Jund wasn’t impressed I suspect most other decks will be far more vulnerable. I admit that this may be dead-end, but I’m not willing to give up on this just yet. I know Wizards will claim this is a delirium enabler, but they can’t fool me: is a dredge card! Now, I have long despised dredge and won’t go to a Modern tournament without Rest in Peace, but I know a dredger when I see one. The self-mill, which has been good in the past in a number of decks, rocks. The fact that it’s repeatable, controllable, and free could be very good. I’ve played against Assault Loam and Loam Pox quite a bit thanks to some enthusiasts in my area and while those decks are very powerful they always fall apart without Life from the Loam. provides those decks with two additional chances to find Loam each turn while also filling the graveyard with all the other dredgers and value that define Loam decks, and this doesn’t seem bad. It might even be good. As for the second line of text, a 1/1 swarm is nothing to sneeze at, and you can easily trigger this once (if not twice) per turn cycle. I expect that you expect me to provide a decklist for this idea. I expected that too, until I actually tried out my lists and found that they were worse in practice than they looked on paper. And they looked like real piles on paper. The current Loam lists are too tight to just shoehorn in Sensation and expect it to be good and it really, really, didn’t play well with Smallpox. The lists I made from whole cloth were just awful and didn’t make it past goldfishing. They were too slow and clunky to beat the goldfish before he died of being a goldfish. They were really good at building huge graveyards, but I tended to mill most of my business and it took forever to put together a win or even enough interaction to plausibly survive to win the game. I don’t know if this means that Sensation is actually bad or if I just don’t know enough about Loam decks to make it work, but if there are any Loam players out there, try it out and let me know. This is where my brew sessions have led me for the moment. I’ve definitely hit a wall with Sensation and I’m turning over Bishop for evaluation by real Affinity players, but I’m going to keep picking at Dragonstorm and see what else develops. While I suspect it’s wasted effort and that normal Storm is just better, the fact that you can play the long game and win off small storm counts suggests that it could be enough better against Storm’s bad matchups to be worthwhile. Only testing will decide, and I’m always open to suggestions in the comments.